^ 第41篇五行 [Chapter 41: Five Elements]. 管子 [Guanzi] (in Chinese). ^ 第40篇四時 [Chapter 40: Four Sections]. 管子 [Guanzi] (in Chinese). ^ 中国农历发展简史 [A brief history of the development of Chinese Lunar calendar] (PDF). ^ Petersen, Jens Østergård (1992). "The Taiping Jing and the A.D. 102 Clepsydra Reform". Acta Orientalia. 53: 122–158. ^ Needham, Joseph (1986) . Science and Civilization in China: Volume 3, Mathematics and the Sciences of the Heavens and the Earth. Science and Civilisation in China: Volume 3. 3. pp. 109–110. Bibcode:1959scc3.book.....N.
^ Ho, Peng Yoke (2000). Li, Qi, and Shu: An Introduction to Science and Civilization in China. Mineola: Dover Publications. p. 105. ISBN 978-0-486-41445-4. ^ Restivo, Sal (1992). Mathematics in Society and History: Sociological Inquiries. Dordrecht: Kluwer Academic Publishers. p. 32. ISBN 978-1-4020-0039-3. ^ Asiapac Editorial, ed. (2004). Origins of Chinese Science and Technology. Translated by Yang Liping; Y.N. Han. Singapore: Asiapac Books. p. 132. ISBN 978-981-229-376-3. ^ Sun Yat-sen (1982) [Telegram originally sent January 1, 1912]. 临时大总统改历改元通电 [Provisional President's open telegram on calendar change and era change]. 孙中山全集 [The Complete Works of Sun Yat-sen]. v. 2. Beijing: 中华书局. p. 5. ^ a b c Aslaksen, Helmer (July 17, 2010). "Mathematics of the Chinese calendar" (PDF). www.math.nus.edu.sg/aslaksen. Department of Maths, National University of Singapore. ^ Sôma, Mitsuru; Kawabata, Kin-aki; Tanikawa, Kiyotaka (2004-10-25). "Units of Time in Ancient China and Japan". Publications of the Astronomical Society of Japan. 56 (5): 887–904. Bibcode:2004PASJ...56..887S. doi:10.1093/pasj/56.5.887. ISSN 0004-6264. ^ 海上 (2005). 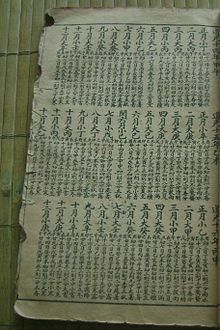 中國人的歲時文化 [Timekeeping of the Chinese culture] (in Chinese). 岳麓書社. p. 195. ISBN 978-7-80665-620-4. ^ a b 陳浩新. 「冷在三九，熱在三伏」 [Cold is in the Three Nines, heat is in the Three Fu]. Educational Resources - Hong Kong Observatory (in Chinese). ^ a b 【典故】冬至進入數九寒天 九九消寒圖蘊藏智慧 [(Classical allusion) As the winter solstice enters into the shǔjǐu cold days, wisdom is hidden in the end-of-winter nine-nines calendar]. Epoch Times (in Chinese). 2014-12-27. Retrieved 15 May 2018. ^ "Days of the week in Japanese". CJVLang. Retrieved 15 May 2018. ^ Liu Rong (2004). "[Subsidiary Relations in the Pre-Qin Period]". 辽宁大学学报：哲社版 Journal of Liaoning University: Philosophy and Social Science Edition (6): 43–50. ^ Cohen (2012), p. 1, 4. Cohen, Alvin (2012). "Brief Note: The Origin of the Yellow Emperor Era Chronology" (PDF). Asia Major. 25 (pt 2): 1–13. Ho, Kai-Lung (何凱龍) (2006). “The Political Power and the Mongolian Translation of the Chinese Calendar During the Yuan Dynasty”. Central Asiatic Journal 50 (1). Harrassowitz Verlag: 57–69. [www.jstor.org]. 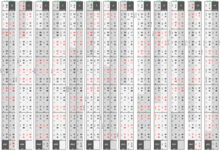 2000-year Chinese-Western calendar converter From 1 AD to 2100 AD. Useful for historical studies. To use, put the western year 年 month 月day 日in the bottom row and click on 執行.